Guys do you like this look? Girls would you wear headscarves/hijabs? This isn't meant to be a religious question, just curious as to what people thing in regards to fashion. This is research for my fashion course. Would definitely wear them/ Like seeing more women wearing hijabs/headscarves? Would never wear them/Don't like seeing women wearing hijabs/headscarves? Prefer the headscarves/hijabs with veils and only eyes showing? Guys, Do you prefer flawless skin or freckles on a girl? What fashion trend or hairstyle did you wear at one time, that you now seriously regret? Does Jen Selter only know one pose? Can femboys attract straight guys? What do you think about freckles on a girl? The other reason I wouldn't wear it is because it feels like it would choke me. O. o Too constricting. I need to stretch and move a lot. Such hideous garments in today's political climate cannot be separated from the subjugation of women by primitive cultures. Women today have much more attractive choices for headgear. Only religious fanatics and old Western women choose such garments today as an aid to hiding grey hair and crow's feet wrinkles. If you must cover your hair choose one of the several varieties of knitted sock-hats for colder weather or a nice broad-brimmed had to guard against the sun. Honestly I don't really have an opinion on it, we have no people at all and I mean at all that wear hijabs in my town some of them in the list you gave us were nice though. Whether or not they wore one though would have no impact on me if they wear one their choice, if not ok lo I don't mind either way. I don't really like the look. It might have been the cool thing to do in medieval times but it's kind of yesterdays news as far as fashions go these days. Sexualchrist is very much a less is more kind of guy. If she feels better when wearing it then it would be fine with me. Kinda sad not to see her full face all the time but I think the style can bring some extra attention because it's different. I picked A but only because when used as a fashion statement. Especially sheer over the face, so you still see who's behind it. From a non-religious standpoint, I don't really see the point in wearing one. Unless you're badly scarred or deformed in some way, it's impossible to look better by covering your head, especially your hair. I wouldn't wear one, because it's generally worn for religious purposes. I don't know but some of the ninja looking ones look hot.. Cause them seductive eyes.. I only like it if its not cultural and unforced. If the woman is cultured to wear it i think nothing of it and dont necessarily "like it". I like it, it looks really cool especially since women who wear hijabs know how to make to match all the time. Also, it covers up women and shows modesty. I actually LOVE this in a fashion sense. Can't really know why, I always thought it was just so exotic. Looks pretty, but there are some ignorant idiots in this country. I say wear it. You know what? 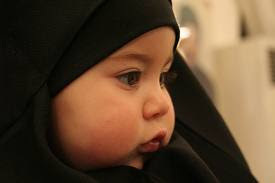 As an atheist and practically lifelong agnostic, I've actually always liked the hijab. I always wanted to wear it, but I remember my 1st foster mother telling me I'm Catholic (I was sorta at that time) and not Muslim. But I always did wanna wear it. I dress very conservatively. Sometimes I do dress a little revealing, but usually I like to cover myself as much as possible. I don't mind them on others. I would never wear one, considering I'm not religious and don't like wearing things on my head. I honestly don't like them, and I would never wear them. I would love taking selfies with them. Very, very, very... And I mean VERY unattractive. I think that is actually looks really nice. I kind of like the way they look. I don't know if I could wear one for a long period of time though, I get overheated easily. Home > Fashion & Beauty > Guys do you like this look? Girls would you wear headscarves/hijabs?